St Patrick's Day is surprisingly popular all over England. Despite the historic differences between the UK and Ireland and despite the looming fractures that, as of this writing, are still anticipated because of Brexit (occurring 12 days after St Patrick's Day), March 17 is a day when everyone celebrates their Irishness - real or imagined. Because of the unusual arrangements between the UK and Ireland, even before the EU was created, Irish people from the Republic have always had the right to work and settle in the UK. As a result, many cities in England have large Irish communities that support big celebrations on Ireland's national day. You don't have to be Irish to celebrate St Patrick's Day in England and around the UK. 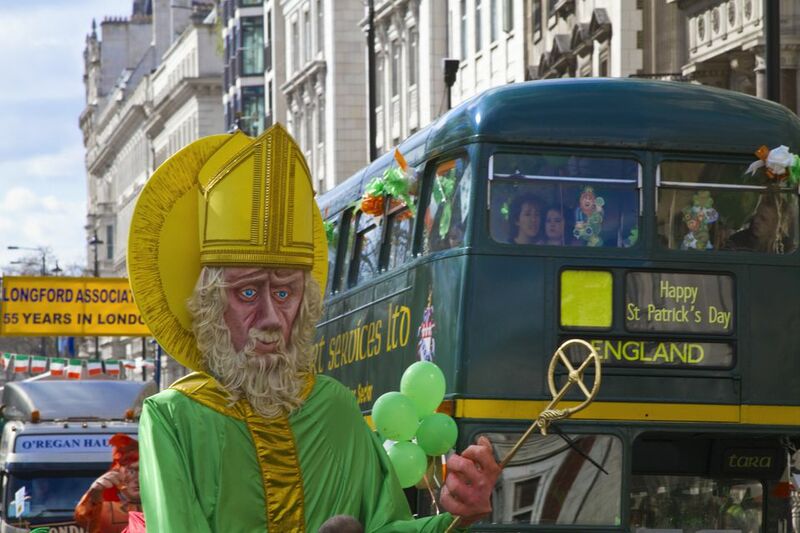 In London they've been celebrating St. Patrick's day for 70 years (as of 2019) The festivals and parades in some of Britain's biggest cities seem to get bigger every year. Here's a run down. London turns St. Patrick's Day in to a weekend festival, from Friday through Sunday. There are performances and all kinds of Irish culture - from step dancing that rivals Riverdance to the latest crop of Irish stand-up comedians. It all culminates in a parade and festival - on Sunday (March 17 in 2019 - in Central London's big public spaces - Trafalgar Square and spilling out into Covent Garden and Leicester Square. In 2019, the London St. Patrick's Day Parade, including marching bands from Ireland and the UK, community groups, sports cubs, schools and street theater, heads out from Piccadilly at noon on Sunday. You can usually register to march behind your Irish county's flag. Details of the parade and other festival features are posted as they are scheduled on the London St Patrick's Day website a few weeks before the event. And it wouldn't be St. Patrick's Day (or week in London) with raising a pint or two in an authentic Irish pub. London has plenty of those Check out These top Irish pubs in London to find one you'd like. If you are looking for the genuine article, try The Tipperary, the old journo's pub on Fleet Street, London's oldest at 413 years in 2016. Manchester lays claim to the UK's biggest St. Patrick's Day Parade, with more than 70 floats, bands and marching groups snaking through the streets from the Irish World Heritage Centre on Queens Road, along Cheetham Hill Road, Corporation Street, Cross Street and Albert Square before retracing the route back to the start. The heritage center also has dozens of events - music, theater and film - throughout the month of March. Check out this year's schedule. The parade starts at noon on the Sunday before St. Patrick's Day. (In 2019 that's Sunday March 10). It's all part of Manchester's two-week plus long Irish festival of music, dance, art, food, drink, comedy and family fun during the first half of March (March 1 to 17 in 2019). Visit the Manchester Irish Festival Website for the full schedule and the latest dates about two weeks before St Patrick's Day. Birmingham goes all out for St. Patrick's Day, regularly attracting as many as 100,000 people for what the city claims is the "third biggest St.
Patrick's Day Parade in the world." In 2019, as St Patrick's Day falls on a Sunday, the turnout is expected to be bigger than ever. As usual, the parade runs from noon to 2 p.m., March 11 on Digbeth High Street, setting out from Camp Hill roundabout. The Parade, that features at least 60 floats and more than 1,000 marchers, is the culmination of a week long Irish festival of music, dance, comedy, food and family events around Birmingham's city center and Millennium Point. And it's a multi-cultural affair. Welsh dragons, Chinese dragons and Caribbean dancers all take part. A highlight of the Birmingham parade is the performance of the massed pipers. At the end of the parade, about 20 minutes after the last floats and walkers have completed the route, all the pipe bands come together to form a mass pipe band. The huge band of pipers then marches from Alcester Street to the Irish Club and then back to Alcester Street. At "The Emerald Village", alongside the parade on Bradford Street, there's free live music, St Pat Rocks, from 2 p.m. until "late". Visit the Birmingham St. Patrick's Festival Website for full details and a parade route. How could a festival and party city like Edinburgh not get in on the St Patrick's Day act? And, of course, being Edinburgh, they are having a festival, complete with a festival fringe. The Festival of Ireland 2019 lasts from March 15 through March 23 and includes concerts, Irish dancing and free showings of classic Irish films. A Grand Finale of Irish and Highland dancing will be held at the Jam House from 5:30p.m. on March 16. Edinburgh's Irish bars will be celebrating too with live music, food and drink plus plenty of good craic. Try Malones or Biddy Mulligans where, in addition to food, live music and Guinness, they've got more than 80 different Irish whiskeys- a pretty good showing in the land of Scotch whisky. At Biddy Mulligans they are also taking part in the a four day Irish festival , Cowgate St Pats, featuring music from 7a.m. to 3 a.m. (phew!) from March 15 to 18.